If you’ve ever submitted a plugin to the WordPress.org repository, you know that with the ever-growing speed at which the WordPress core team releases new versions, it’s inevitable that plugins will fall behind and out of date. It’s a fact of life, if only because we don’t necessarily have the time to stay on top of it. We’ve all done it. But here’s the thing: once a plugin is more than two years out of date, it’s dropped from search results on WordPress.org. To be more specific, it’s dropped from search results on WordPress.org and within the WordPress dashboard. This last point is key. I doubt it comes as a great surprise to most plugin developers though, especially since it was announced in Matt Mullenweg’s State of the Word speech three years ago at WCSF 2011. I just wanted to share with you this morning, a visual representation of what it looks like when one of your plugins hits the 2-years out-of-date mark. This is a screenshot of the download stats for a plugin I maintain. 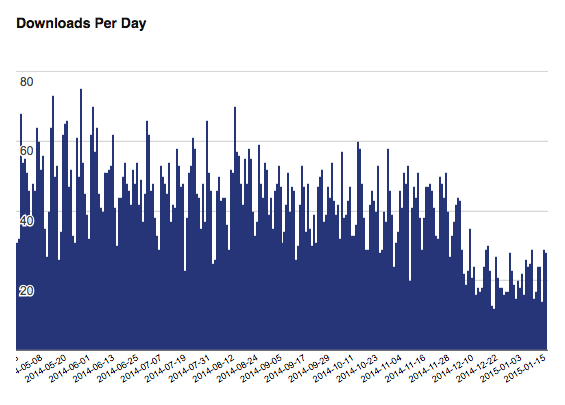 You’ll notice that average daily downloads is cut almost in half around the December 10th mark. Up until this morning, the last-updated date was December 8, 2012. It’s pretty interesting to see what a difference it makes to have your plugin available in search results. Do yourself a favor and keep your plugin(s) updated.